In honor of the 50th Anniversary of the founding of the NBA, league officials honored 50 of the greatest players in NBA history during the league’s half century of play. 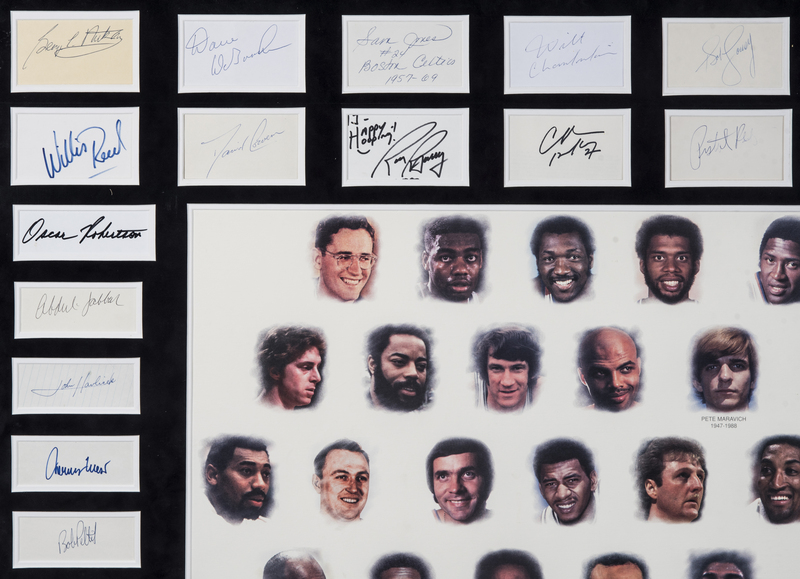 The players selected spanned the entirety of the league’s history up until the mid-1990’s, with players as diverse as George Mikan and Shaquille O’Neal honored. 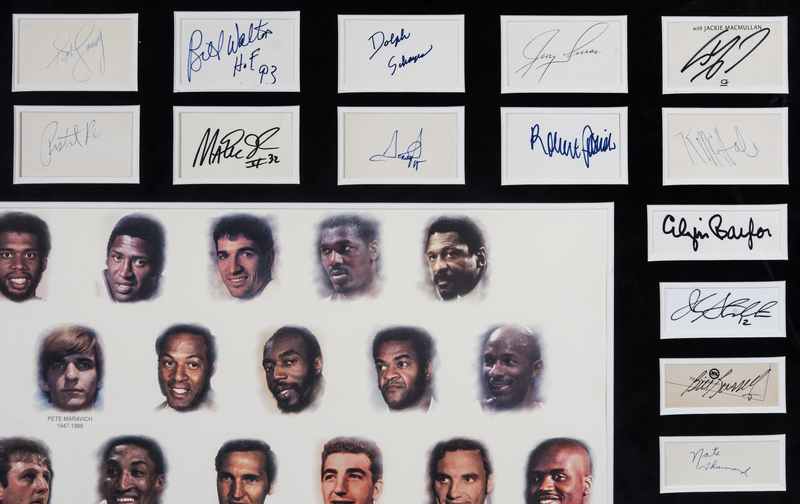 When this list was created, before the 1996-97 season, the 50 honored players had accumulated 107 NBA Championships, 49 Most Valuable Player Awards, 17 Rookie of the Year honors, 447 All-Star Game selections, 36 scoring titles, 923,791 total points and 410,327 total rebounds. 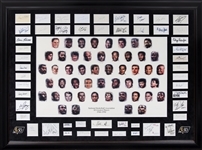 This Field of Dreams 50 Greatest Players lithograph is unsigned and displayed in a 59 x 44-inch frame. 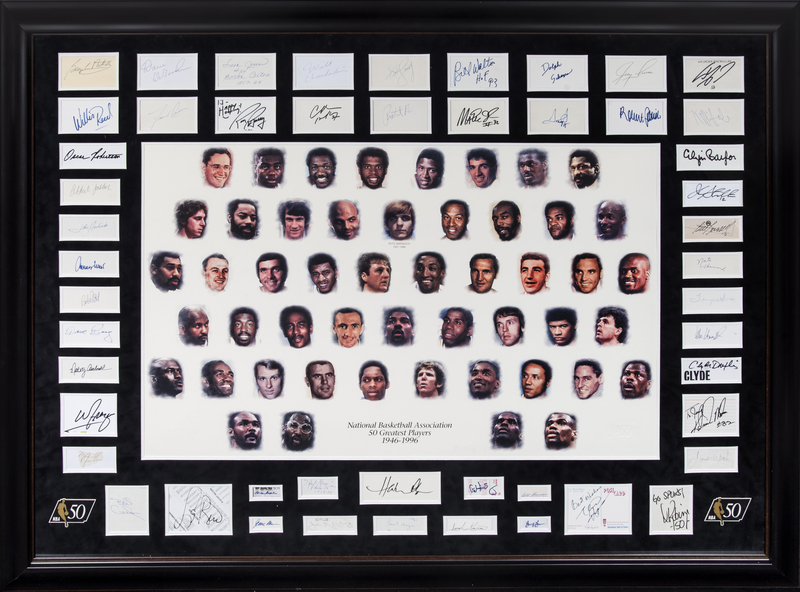 Lining the border of the frame are 50 cuts signed by the players that make up the NBA 50 Greatest lithograph. 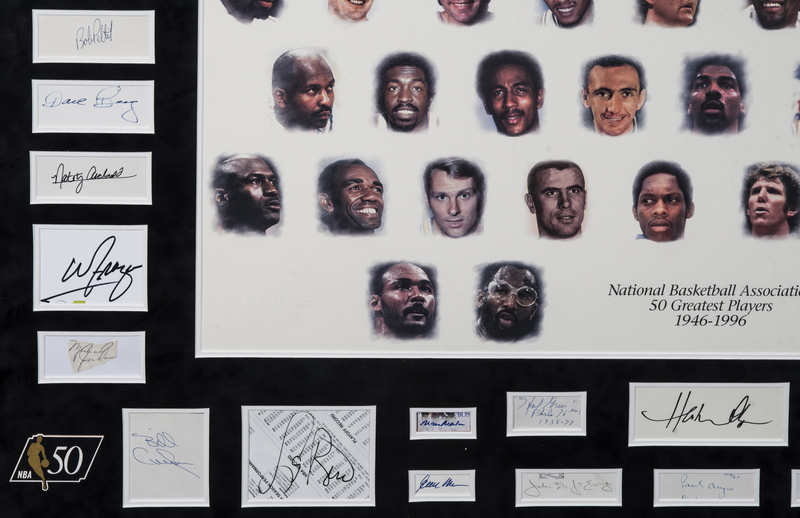 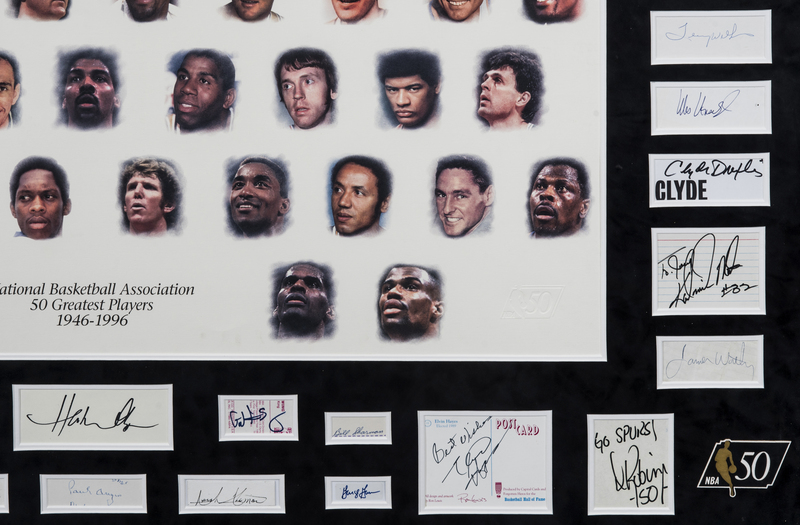 This piece is unique in that it includes the signature of Hawks and Jazz Hall of Famer Pete Maravich, whose tragically premature passing in 1988 precluded him from signing any of the 50 Greatest Player lithographs directly. 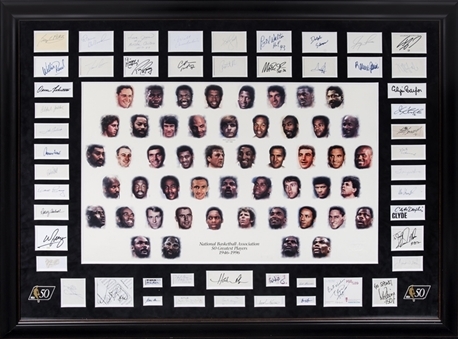 The cuts included in this framed display have been signed by Kareem Abdul-Jabbar, Nate Archibald, Paul Arizin, Charles Barkley, Rick Barry, Elgin Baylor, Dave Bing, Larry Bird, Wilt Chamberlain, Bob Cousy, Dave Cowens, Billy Cunningham, Dave DeBusschere, Clyde Drexler, Julius Erving, Patrick Ewing, Walt Frazier, George Gervin, Hal Greer, John Havlicek, Elvin Hayes, Magic Johnson, Sam Jones, Michael Jordan, Jerry Lucas, Karl Malone, Moses Malone, Kevin McHale, George Mikan, Earl Monroe, Hakeem Olajuwon, Shaquille O’Neal, Robert Parish, Bob Pettit, Scottie Pippen, Willis Reed, Oscar Robertson, David Robinson, Bill Russell, Dolph Schayes, Bill Sharman, John Stockton, Isiah Thomas, Nate Thurmond, Wes Unseld, Bill Walton, Jerry West, Lenny Wilkens, James Worthy, and “Pistol” Pete Maravich. 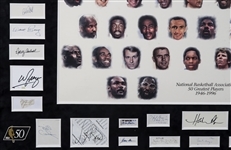 The signatures have been written in blue and black pen and marker. 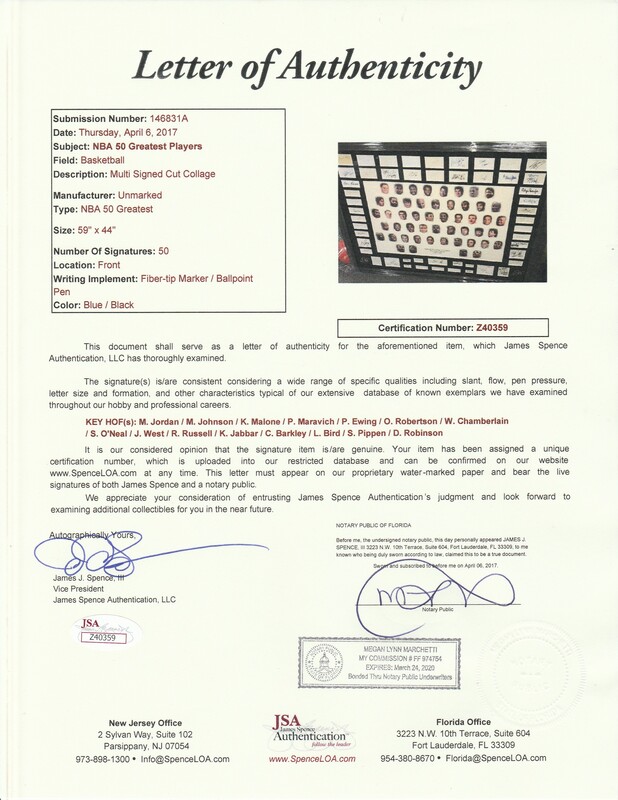 This stunning piece is accompanied by a LOA from JSA (Z40359).